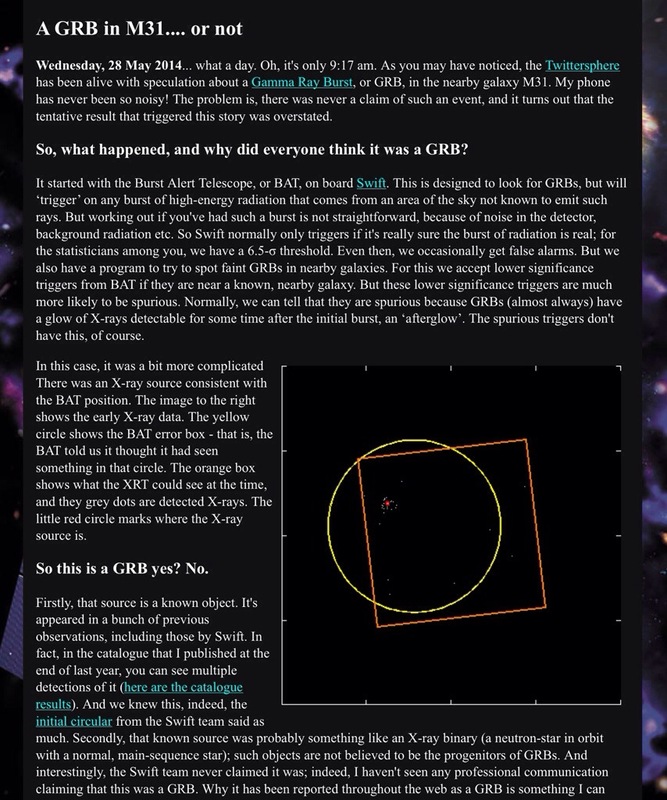 More on the controversy over the BICEP2 results which claimed back in March to have discovered the B-mode polarisation due to gravitational waves in the very very early Universe. It seems others claim that BICEP2 did not correctly subtract the polarisation signal from dust in our own Milky Way. The controversy continues to develop over the interpretation of the results from BICEP2, the experiment that detected “B-mode” polarization in the sky, and was hailed as potential evidence of gravitational waves from the early universe, presumably generated during cosmic inflation. [Here’s some background info about the measurement]. Two papers this week (here and here) gave more detailed voice to the opinion that the BICEP2 team may have systematically underestimated the possible impact of polarized dust on their measurement. These papers raise (but cannot settle) the question as to whether the B-mode polarization seen by BICEP2 might be entirely due to this dust — dust which is found throughout our galaxy, but is rather tenuous in the direction of the sky in which BICEP2 was looking. Well, it would seem it was all a false alarm. For one of the best and most detailed explanations of why the false detection happened, check out this link. So, no spectacular supernova in Messier 31 yet. But we can live in hope. Today I thought I would share this beautiful song by R.E.M. 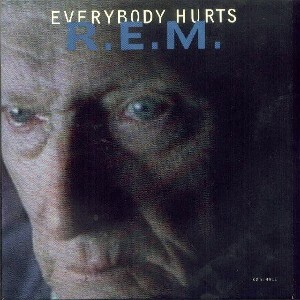 “Everybody Hurts” was released as a single in 1993 and is from their 1992 album “Automatic For the People”. It reached number 7 in the Disunited Kingdom singles charts, and got to number 29 in the US. The song was composed by all four of the band’s members, although the drummer Bill Berry wrote most of it. Here are the lyrics. 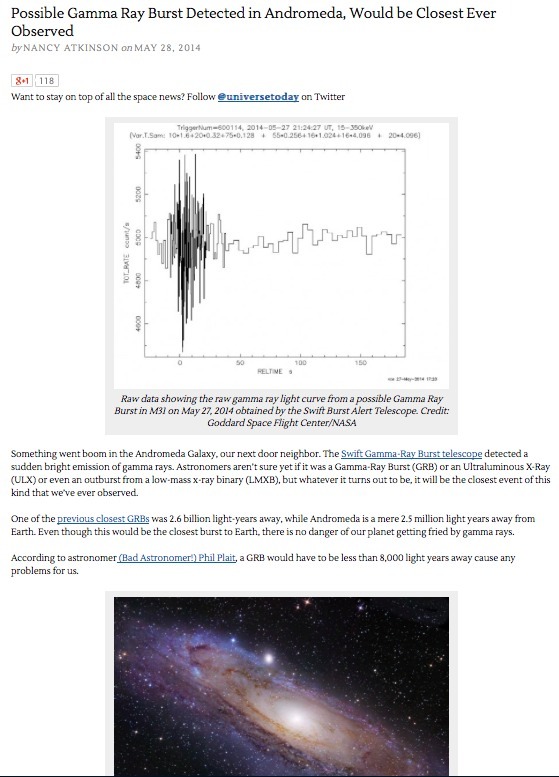 A gamma ray burst in the Andromeda galaxy? A few days ago news broke that NASA’s gamma ray satellite called Swift had detected what was possibly a burst of powerful gamma rays coming from the Andromeda galaxy (Messier 31), the closest large galaxy to our Milky Way galaxy. This story still seems to be in the early stages, so I have not been able to find too much information as of yet, except that it has happened. Further analysis should show whether it was really a gamma ray burst, or a high energy x-ray event. Also, within the next few days, we should be able to detect an optical counterpart to this event, which will enable us to not only determine its precise location but also determine the nature of the object which has caused the burst. 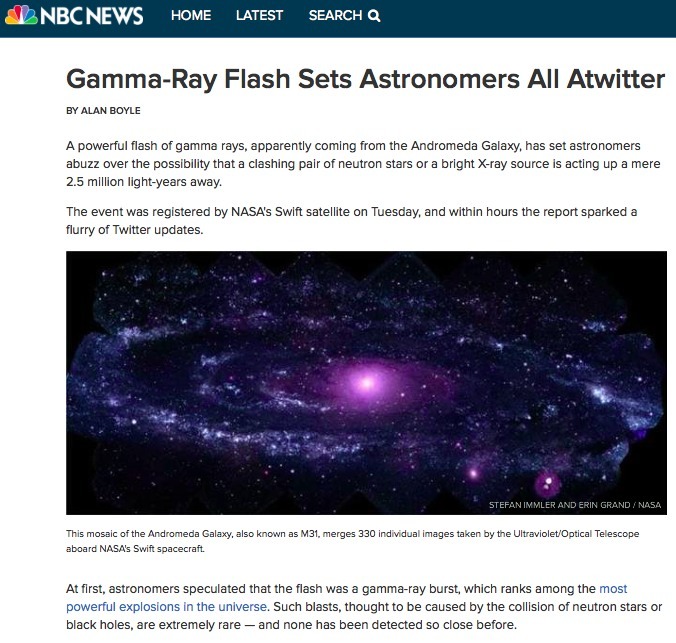 If it is a gamma ray burst then this is tremendously exciting. There has not been a gamma ray burst anywhere like as close to us anytime in the 50-odd years that we’ve had the ability to detect them. Gamma ray bursts are amongst the most energetic phenomena in the Universe, and are thought to be associated with such cataclysmic events such as the explosion of a star (a supernova), the formation of a black hole or the merging of e.g. two neutron stars. I am crossing my fingers that this event is related to a supernova, because if it is it should be close enough to see very easily with the naked eye. However, although I haven’t looked into this, it would seem to me that a supernova would also have led to a huge flux of neutrinos, and to my knowledge no such neutrino flux has been detected, so maybe it isn’t a supernova. We shall have to wait and see. 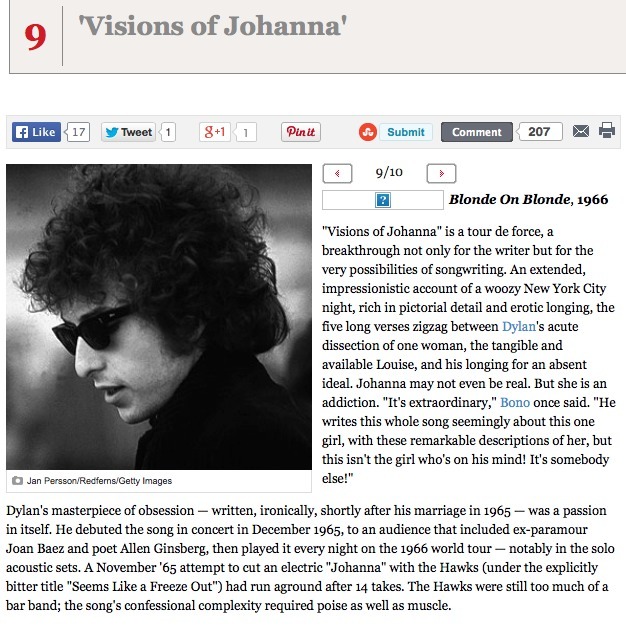 At number 9 in Rolling Stone Magazine’s 10 best Bob Dylan songs is “Visions of Johanna” from his seminal 1966 album Blonde on Blonde. I blogged about this album and this song here, so I won’t add much here except to re-post the lyrics to this incredible song. You can find the link to this song on Bob Dylan’s official website here, which not only includes the lyrics but also various audio clips including the original studio version and a couple of live versions. I have hunted down this live version of Visions which is from one of Dylan’s concerts in 1966, the tour where he was roundly booed during each performance when he played the second half of his act as an “electric” set, with a backing band, instead of his acoustic folk style that many of his fans had come to hear. A very interesting summary of a recent conference on our current understanding of dark matter……. Last week I attended the Eighth Harvard-Smithsonian Conference on Theoretical Astrophysics, entitled “Debates on the Nature of Dark Matter”, which brought together leading figures in astronomy, astrophysics, cosmology and particle physics. Although there wasn’t much that was particularly new, it was a very useful conference for taking stock of where we are. I thought I’d bring you a few selected highlights that particularly caught my eye. Last week I stumbled across this wonderful link on the National Geographic website, a travel photography competition. There are dozens and dozens of wonderful photographs here, and I highly recommend following the link and spending a few tens of minutes taking a good browse, but here are (only) some of my favourites.